Laminins are interesting proteins, which is just as well, because they are what I am working on at the moment. The pictures (mostly rotary shadowed electron micrographs) of intact laminin are 2 dimensional representations of flexible 3-dimensional molecules, (see fig 1). They don’t look like crucifixes, because they have 3 dimensions – they probably look more like palm trees. Fig 1. A Laminin electron micrograph. This is first protein I’ve worked on that has its own page at Snopes.com, which is quite an achievement. Right, now I’ve got this curious case of molecular pareidolia off my chest, let’s crack on with why Laminin is pretty damn interesting all by itself. Laminin is a principal component in extracellular structures called ‘basement membranes’ (not the same as lipid/plasma membranes, which you might have heard about in high school biology). Basement membranes are important structures that incorporate Laminins, collagens and other ECM proteins to form protein barriers that separate different tissues layers. Each Laminin molecule is actually 3 different protein chains attached to each other. Because scientists are exceptionally inventive and imaginative, these three proteins are called Laminin alpha, beta and gamma chains respectively. 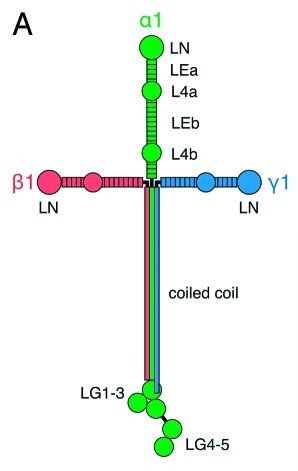 Fig 2: Schematic of a Laminin molecule. One end of each of the three proteins (the palm tree fronds / the animo-terminus) has an LN-domain (marked LN), and this is involved in forming the basement membrane itself. 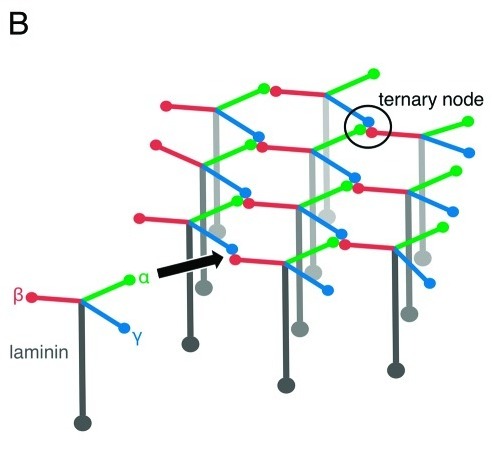 An LN domain from 3 different Laminin molecules come together to form a sheet like network as shown in fig 3. By binding to proteins on the surface of the cell called integrins. This happens through the LG1-3 region. By binding to a specific sugar which is attached to a protein called Dystroglycan. This happens through the LG4-5 region. 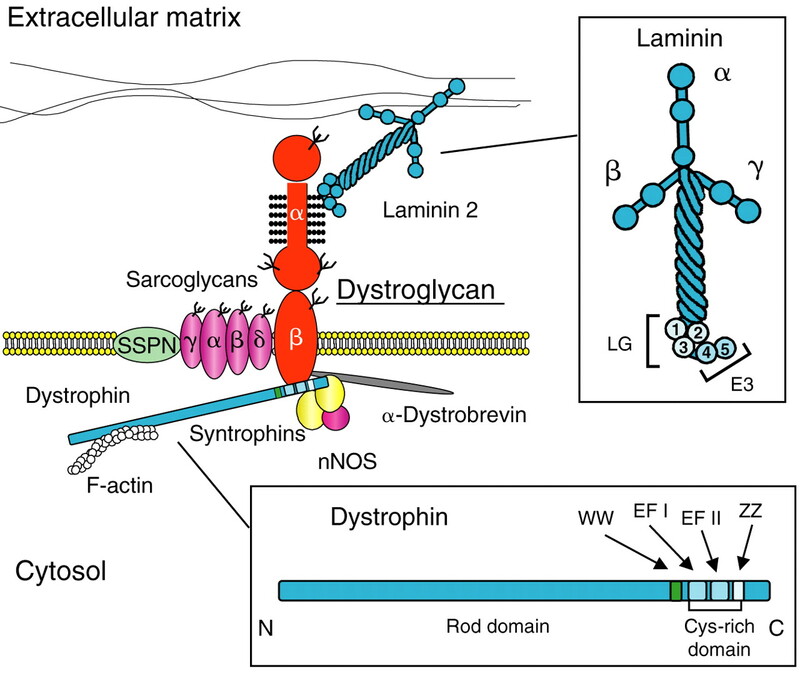 Dystroglycan is an integral membrane protein – it sits within the plasma membrane (not basement membrane) and has bits that protrude into both the extracellular and intracellular spaces. It links the basement membrane (outside the cell) to the cytoskeleton (a protein framework inside the cell) – see Fig 4. The extracellular side of Dystroglycan has a unique sugar polymer covalently attached to it. This sugar (called the ‘LARGE glycan’ or ‘Matriglycan’) has so far only been found attached to Dystroglycan until last week had only been detected on one protein – alpha-dystrogylcan. A recent paper by our collaborators – as demonstrated that this sugar can also be found on other proteins, attached via the same sites known to be occupied by other sugar modifications of proteins (such as the glycosaminoglycans, Chrondroitin Sulphate and Heparan Sulphate). 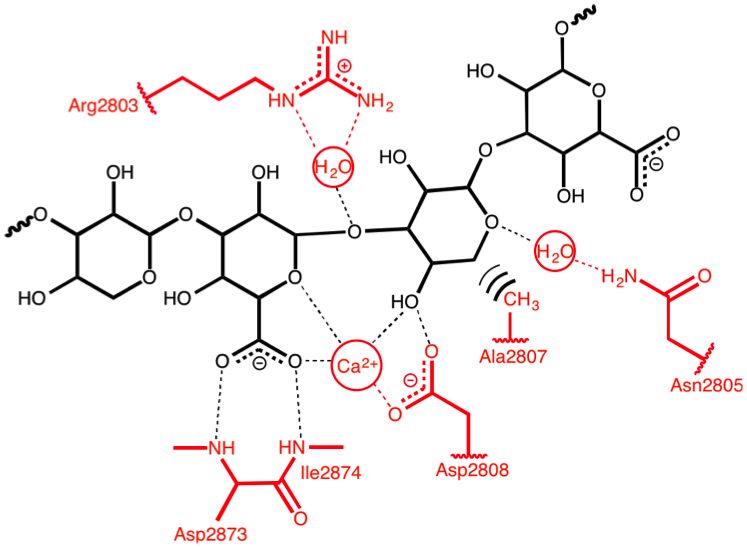 The synthesis of the LARGE glycan is also complex, and the whole linkage region has only recently been mapped. Figure 5 shows a summary of what we know so far about the structure of the LARGE glycan and lists the enzymes that are involved in synthesising it. Fig 5: How to make LARGE glycan. By the author, information from various papers. The business end of the LARGE glycan is the -[Glucuronic acid – β1,3 – Xylose α1,3 ] disaccharide polymer – the repeating orange stars and blue/white diamonds on the right of Fig 5. So what the hell is that then? 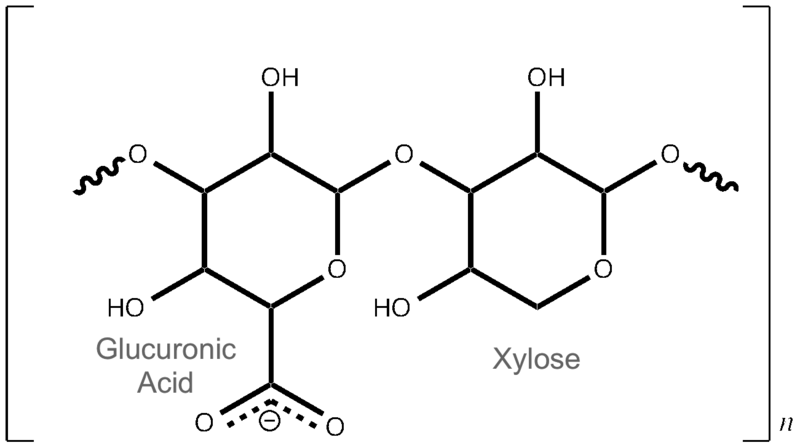 It is a long chain of alternating Glucuronic acid (a sugar acid similar to Glucose) and Xylose (a sugar that was first isolated from wood, hence Xylose, derived from the greek for wood) units (see Fig 6). The β1,3 & α1,3 refer to how they are connected. We don’t know quite how long it is yet, or how many modifications there are on each dystroglycan molecule (either 1 or 2). More research required! In a nutshell, muscular dystrophy. you get muscular dystrophy. Loss of the genes that encode LARGE glycan synthesis (i.e. the genes shown in Fig 5) lead to a subset of extremely severe muscular dystrophies called “dystroglycanopathies“. They are congenital (inherited) diseases that prevent correct formation of basement membranes. This means that tissues do not form properly, and gives rise to developmental disorders. If we can understand this system, maybe we can fix it? So, we know what the LARGE glycan is made up of, and we know that it binds to the Laminin G-type (LG) domain 4 of Laminin alpha 2. What we want to know is how they interact with each other at an atomic level – happily the best tool for this sort of study is X-ray crystallography, which is what I do for a living! So I expressed, purified2 and crystallised (Fig 7) a fragment of Laminin alpha 2 which contained the LG4 and LG5 domains. I then soaked a tiny (and I mean tiny) amount of the LARGE glycan that our collaborators had synthesised for us into my crystals. Given that when I did this, we had no idea of tightly Laminin alpha 2 bound to the LARGE glycan, this was a bit of a long shot. I setup around 20 different experiments, with different soaking times and concentrations to try and get some ligand into the protein. I cryocooled the crystals in liquid nitrogen and sent them off to Diamond Light source, where we collect our diffraction data. My remote access data collection shift started at 4am. Oh joy. An early start, plenty of coffee and a taxi to work and I was good to go. 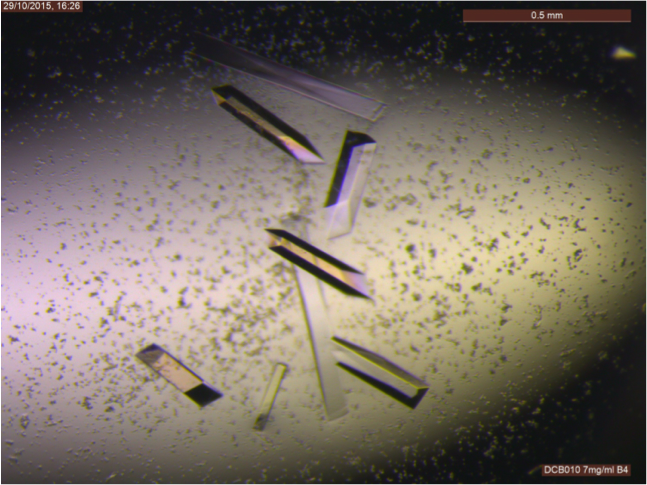 However – a drawback of the ligand soaking approach I had to take was that I would have no idea whether or not my crystals had the ligand in until I had processed all the data. I didn’t have the time to process the data as I went along, so the data collection was done using ‘the American method’ – Shoot first, ask questions later. After my 5-hour shift was up, I grabbed breakfast and more coffee and started to process all my data. About 5 datasets into my haul of data, I hit the jackpot. 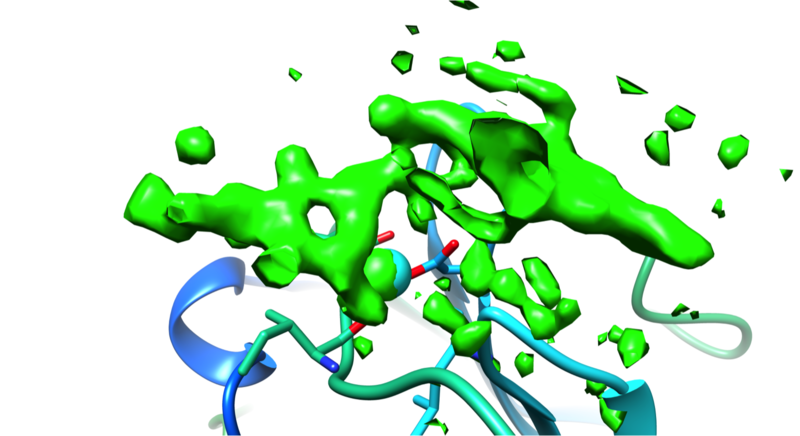 Fig 8a : What the Calcium binding site in LG4 looks like. Fig 8b: Difference density map of SOMETHING. Above the calcium binding site in LG4, right where it was predicted to be, was a big green blob in my electron density difference map. 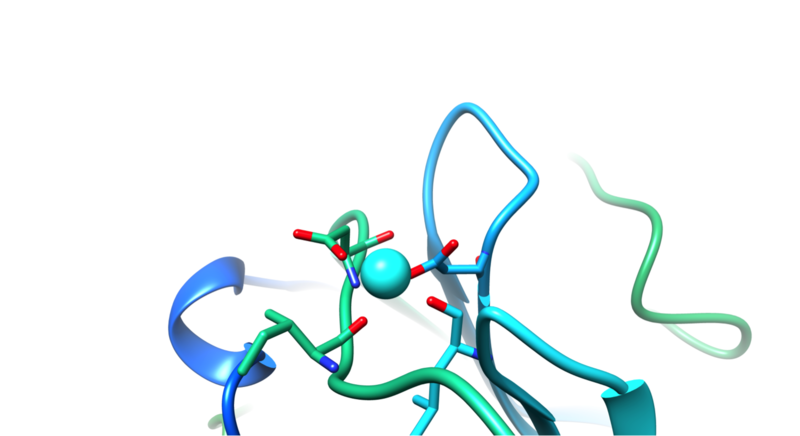 If you look at Fig 8a, you can see what the empty binding site looks like – this is a very much simplified representation as there is an awful lot going on. The cyan sphere is a calcium ion. The red/green/blue sticks around the calcium show the orientation of the amino acids in the protein that bind to the calcium. The loops and whirls represent other bits of the protein. I generated an electron density map that highlights the differences between an empty crystal and a soaked crystals (fig 8b). To generate this map, I simply subtract data from an empty crystal (apo form) from data of a soaked crystals (bound form) – the difference between the two datasets should equal the ligand. Happily, it does! After a bit of building and refining, we end up with the final refined structure of the Laminin:LARGE glycan complex. Fig 9: THAR SHE BLOWS! Figure 9 shows this final structure of the ligand with the same density shown in Fig 8, just made transparent. Fig 10: A schematic of important interactions in-between Laminin (red) and the LARGE glycan (black). When we dive into the binding site and take a look around (Fig 10), we see that all the interactions are between a single glucuronic acid – xylose repeat, even though there are 3 repeats in the sample of LARGE glycan we used. The link between the two sugar rings straddles the calcium ion, forming a sort of chelating or clathrate-type interaction. Oxygen atoms (carrying a net negative charge) interact strongly with the positively charged calcium ion . The carboxylic acid group in the glucuronic acid ring (The O=C=O bit) also pokes into a little positively charged pocket formed by two backbone amino groups (NH). All these interactions combine to form quite a strong interaction for (~0.2µM KD, if anyone is interested) for an interaction with a relatively small interaction surface. 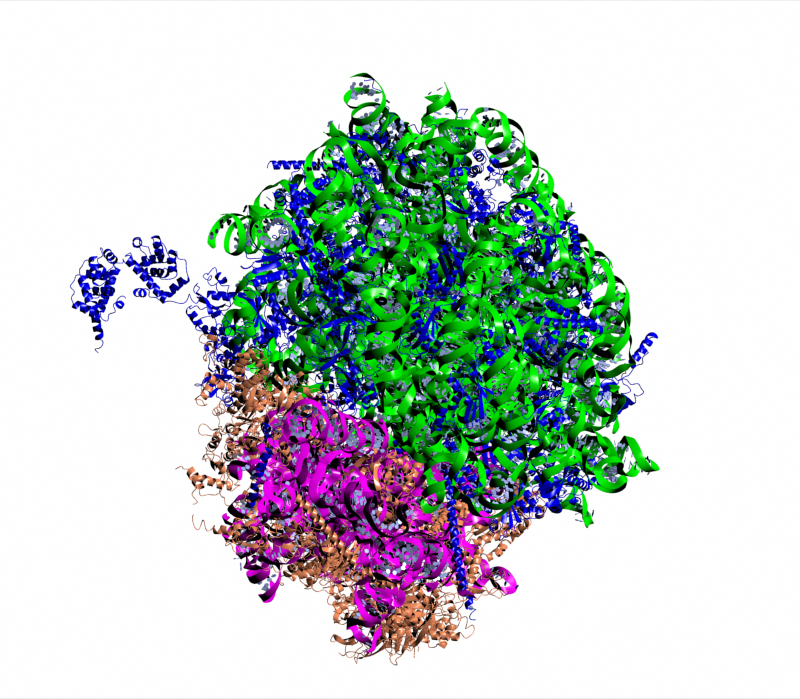 We now know exactly how Laminins bind to the LARGE glycan. Let’s be clear – this is not a drug target – we definitely do not want to inhibit this interaction! But this shows us a crucial link in the chain between the cytoskeleton (the internal skeleton of a cell) and the outside world. 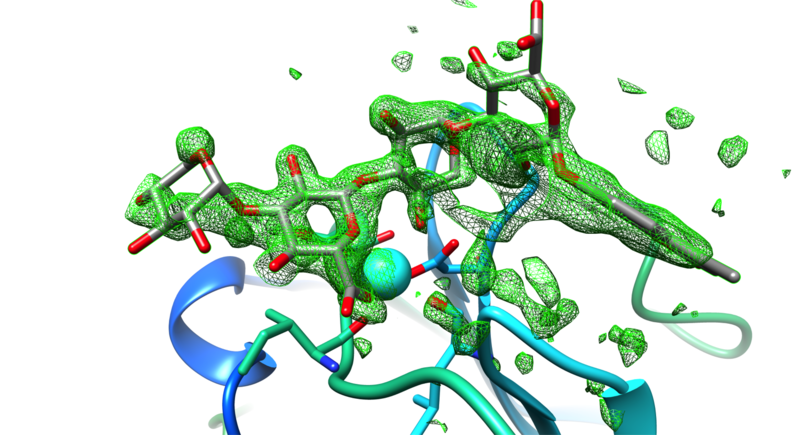 We have also seen a really interesting and novel mode of protein-carbohydrate interaction. The Laminin does not recognise individual sugars – it recognises the unique linkage found in the LARGE glycan. 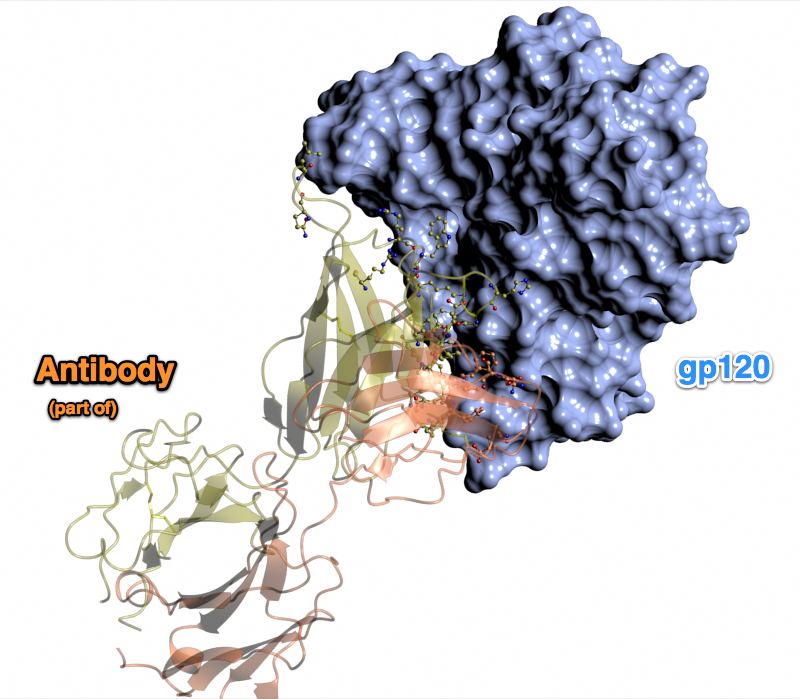 Given that there are over 100 proteins in the human genome that contain LG domains, and some of those are also known to bind to the LARGE glycan, our structure provides a paradigm for LG domain – LARGE glycan interactions. We know that a single disaccharide is sufficient for Laminin to engage (although longer stretches of sugar bind more tightly) and we show that the sugar forms a pseudo-clathrate cage over the calcium in the protein. This is probably why the Laminin-LARGE interaction is ~10x tighter than interactions between proteins and other similar sugars. Anyway – the paper should be out NOW in Nature Chemical Biology. Hetero – different, trimer – three. Made up of 3 different proteins. Made in mammalian cells – we give mammalian cells DNA that encodes our protein. You are currently browsing the archives for the Protein Structure category.